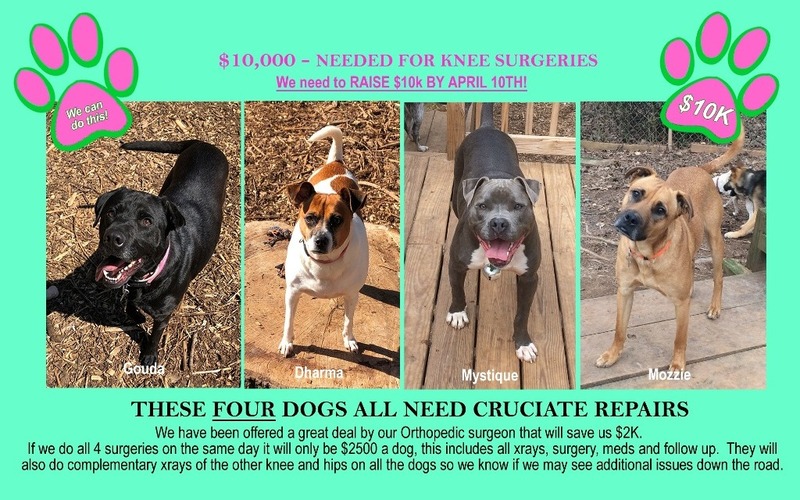 We have four dogs in need of cruciate ligament repairs plus a couple of luxating knee caps that have to be address while in surgery. To save $2k, we need to raise the money to have these dogs all done on the same day. The $10K needed includes all xrays of both knees and hips on each dogs, surgery, medications, follow up appointments and xrays, etc. It is actually a really great deal from the top orthopedic veterinary surgeons in Georgia! WE CAN DO THIS! THIS HAS TO BE OUR FUNDRAISING FOCUS RIGHT NOW! PLEASE DONATE! EVEN $5 gets us closer to paying for surgery. SURGERY IS SCHEDULED FOR APRIL 10TH!!!!!! !